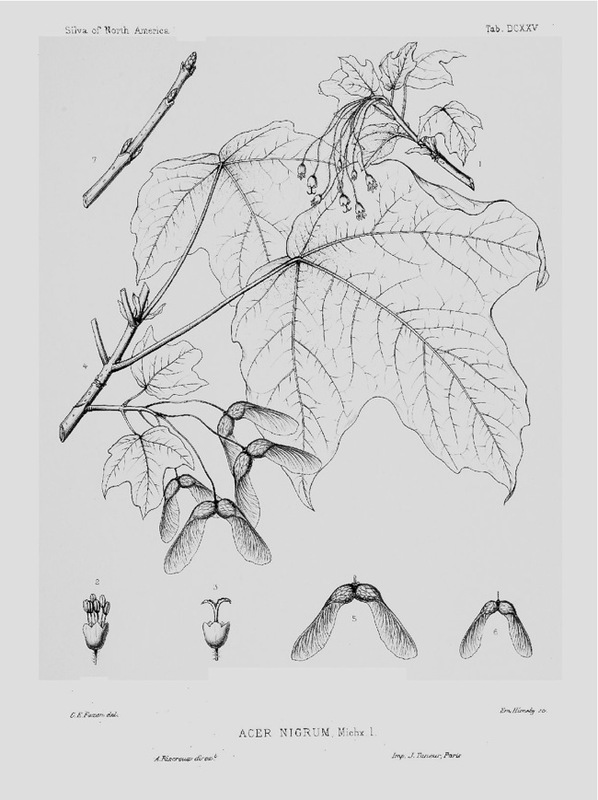 First botanicaly described as Acer nigrum by Micheaux in 1818 [N. Amer. Sylv. vol.2, p.238/1818]. Considered as a subspecies of Acer saccharum Marsh. 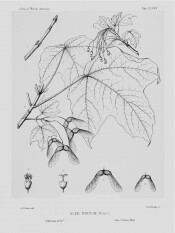 by Desmarais [Brittonia vol.7, p.382/1952] and Acer saccharum subsp. nigrum (F.Michx.) Desmarais is the botanical name by which it is known today. Figured in Sargent - Silva of North America, Supplement vol.XIII, t. DCXXV/1892, the figure used here. ‘Acer nigrum is distributed from the valley of the St. Lawrence River in the neighborhood of Montreal southward to the valley of Cold River, New Hampshire,2 and through western Vermont,3 and westward through northern New York, Ontario,4 the southern peninsula of Michigan, Indiana, Illinois, and Iowa, to northeastern South Dakota,5 western Missouri,6 and eastern Kansas,7 and southward through western New York and Pennsylvania to southwestern Virginia 8 and Kentucky. Comparatively rare near Montreal and in Vermont, the Black Maple becomes more abundant farther west, and, growing with the Sugar Maple, it can be distinguished at a glance from that tree in summer by its heavy drooping leaves, which make it a conspicuous object in the forest or by the roadside, and at all seasons of the year by the color of its young branches. In Iowa it almost entirely replaces Acer Saccharum, and it is the only Sugar Maple of South Dakota. The Black Maple was first distinguished by the younger Michaux. It is often cultivated as a shade tree, particularly in those parts of the country where it grows spontaneously.’ [Sargent - Silva of North America, Supplement vol.XIII, p.10/1892]. Introduced to Britain in 1812 [PD]. Grown in the gardens before 1843. Listed in all published catalogues [T.698/1843]. Negundium americanum DC. ex Loud. is an accepted synonym of Acer negundo L. which see. But Macarthur clearly identifies this tree as Black Ash rather than Ash-leaved Maple so it seems likely that the Linnean binomial given by him is incorrect and that Acer saccharum subsp. nigrum (F.Michx.) Desmarais was intended.